Although nicely restored examples of BMW's contribution to the microcar era can command serious prices the cost of filling at least part of your yard with this assortment of Isetta shells and parts currently listed on Ebay is surprisingly affordable—at least initially. The Isetta was originally designed by Iso—an Italian refrigerator company—and was produced by several companies in various countries, but it is BMW's version of unique one door microcar that was most successful and is consequently the best known. The German car company produced over 160,000 Isettas between 1955 and 1962. Somehow 50 years after the last one rolled out of a German factory, three examples of the strange little cars have ended up in a yard in Austin, TX where they are currently for sale, along with the parts of countless others. 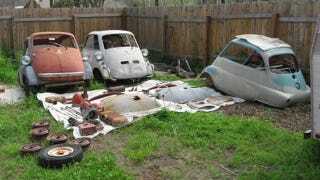 As the seller explains the cars in the very brief description, this lot of Isetta projects include "two abandoned restorations and a parts car" as well as "a ton of parts". Although we admit the idea of two and a half Isettas is a bizarrely attractive proposition something tells us it wouldn't take long to figure out exactly why both restorations were abandoned. Even with this in mind, something about the prospect of several obscure project cars being sold together always manages to appeal to our subconscious desire to make ourselves miserable with ill-conceived project car hell. Perhaps most importantly the cost of filling your yard with ancient rusty German microcars is only $4550 with less than two days left on the auction. In theory this seems like an amazing deal for not one but two Isettas considering we found restored examples advertised with price tags anywhere from high twenty thousands to forty thousand dollars. However after factoring in the realistic price of turning this yard full of Isettas into two functional cars—not mention the inevitable ill effects your Isetta projects will have on your relationship with your neighbors, significant other and sanity—all of a sudden buying a nicely restored micro BMW doesn't seem like such a bad idea.